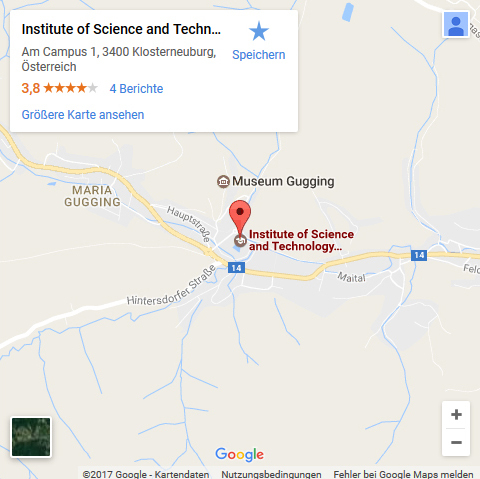 If your navigation system has troubles finding our address, please try it instead with our former address “Hauptstrasse 2, 3400 Maria Gugging”. Thank you! 1. Leave Vienna city center via Donaukanal Bundesstrasse (B227) in the direction Nordbrücke. 2. Exit B227 before reaching Nordbrücke and take Klosterneuburger Bundesstrasse (B14) until you reach Klosterneuburg. 3a. Follow the IST Austria signs along the B14 from Klosterneuburg towards Tulln through Kierling until you reach Maria Gugging. 3b. Should you take the bypass road follow IST Austria sign at final roundabout and turn right onto B14 towards Tulln. Follow the B14 from Klosterneuburg through Kierling until you reach Maria Gugging. 4. Turn right at roundabout after place-name sign “Maria Gugging”. 1. Take the U4 subway (green line) in the direction of Heiligenstadt until the last stop. Follow the bus sign at the exit to find the IST shuttle bus station at the corner of Boschstraße and Mooslackengasse. 2. 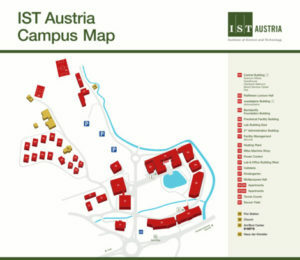 Take the IST Shuttle bus or the local bus 142 to stop “IST Austria”. The trip takes approx. 15 and 30 minutes. Important note: The talks invitation entitles you to use the IST Austria shuttle bus free of charge, you can access or download your talks invitation from our talks calendar. 1. Take the CAT train directly from the Vienna Airport to Landstrasse-Wien Mitte station. Alternatively you can take the S7 train to Landstrasse-Wien Mitte station, this service takes 5 min longer than the CAT service, but is much cheaper. 2. Take the U4 subway direction Heiligenstadt to the last stop. Follow the bus sign at the exit to find the IST shuttle bus station at the corner of Boschstraße and Mooslackengasse. 3. Take the IST Shuttle bus or the local bus 142 to stop “IST Austria”. The trip takes approx. 15 and 30 minutes. The CS Talk series is held at the seminar room Mondi 2 on the ground floor of the Central building (unless noted differently).